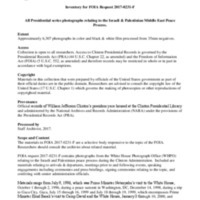 This collection contains photographs relating to the Israeli and Palestinian Peace Process, as well as material related to the broader topic of Middle East Peace. The collection includes materials from Prime Minister Netanyahu’s July 1996 White House visit, an October 1996 peace summit in Washington, D.C., a December 1998 trip to Gaza City, Prime Minister Ehud Barak’s July 1999 visit to the White House and Camp David, the January 2000 Sheperdstown peace talks, and the December 2000 meeting with President-elect George W. Bush. Key individuals in these records include President William Jefferson Clinton, First Lady Hillary Rodham Clinton, Vice President Albert “Al” Gore Jr., Prime Minister Binyamin (Benjamin) Netanyahu of Israel, Prime Minister Ehud Barak of Israel, Chairman Yasser Arafat of the Palestinian Liberation Organization (PLO), and King Hussein of Jordan.